Dancers small, tall, and in between swarmed the Irish Cultural Centre of New England campus June 14 for the second Boston Irish Festival Feis, a day of Irish step dance competitions that attracted some 450 participants of various ages and levels from across the Northeast, as well as from Toronto, South Carolina, and even New Zealand. Co-organized with the Harney Academy of Irish Dancing, the Feis was the third of three consecutive weekend Boston Irish Festival events celebrating popular Irish pursuits at the Canton-based ICCNE, which is marking its 25th anniversary. On May 31, the festival featured a day of sporting events – notably hurling and Gaelic football – and children’s activities. 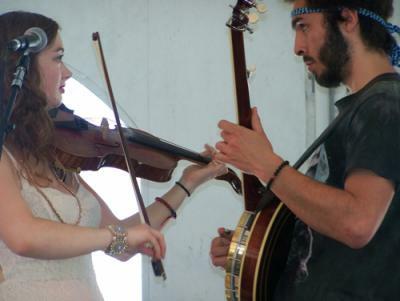 The middle portion of the festival, June 6-7, showcased top-line Irish/Celtic acts Black 47, The Screaming Orphans, and Eileen Ivers & Immigrant Soul, as well as numerous musical performers from the Greater Boston area and elsewhere in the region. Misty, murky weather greeted the Feis, and a steady, 45-minute drizzle at mid-day posed a potential threat to the styled hair and make-up sported by some of the competitors. But most of those present, being pretty experienced in matters of feis, seemed unperturbed by the damp and focused on the task at hand – although a number of younger dancers found the temptation of the center’s playground facilities irresistible. The day’s competitions took place in two tents, the “Grades Stage” on the ICCNE patio, and the “Championship Stage” about 50 yards or so away on the grass. The dance floor in the packed Grades Stage was divided into four separate sections (using yellow “Caution” tape as dividers), and competitors – sometimes in groups of three or four – did their routines, then cleared the area hurriedly for the next. It was less crowded at the Championship Stage, with dancers mainly competing in pairs, but adjudicators kept things moving along briskly: One pair would complete their routine, bow, stand and wait while the adjudicators tabulated scores and the next pair of dancers took the stage; at the ring of a small bell, the previous competitors departed and the next round would begin. Wait, you do Irish dancing in grocery stores? “Um, sometimes,” said Mussari, bursting into laughter along with Gilmore. Elsewhere, 10-year-old Maeve McCann of Hanover and 11-year-old Weymouth resident Megan Siegfried, along with their respective mothers, Nancy and Maria, enjoyed some cool drinks while waiting for the results of their competition to be posted. Both girls have a few years of experience in Irish dance, and taking part in a feis definitely ranks as a high point. “You go to your class every week, you really focus, and then you come here and make your hard work pay off,” said Megan. Rockland resident Kristen Gallagher, an Irish step dancer as a child, watched her nine-year-old daughter Mairead stretch out and warm up. “We’ve made some wonderful friends through Irish dancing, and I really like the confidence it gives the kids,” she said. Everything? All the practice, the long hours, the aches and pains? “Everything,” she repeated, with emphasis. By contrast, mere yards away at the Celtic Patio Tent stage, Cat and the Moon – a quartet of Berklee College of Music students – played high-energy instrumentals that fused Irish/Celtic, bluegrass and jazz styles, as fiddler Kathleen Parks and five-string banjoist Ricky Mier traded licks with one another, as well as bassist Charles Berthoud and guitarist Eamon Sefton (who fondly recalled attending the festival as a child). Clearly enlivened by the atmosphere, a clutch of toddlers used the tent’s dance floor to demonstrate their considerable skills in romping and scampering. Meanwhile, underneath the mid-day sun at the Emerald Field Stage, the trio Inchicore (Derrick Keane, Tom Miller and Damon Leibert) entertained the audience with “Some Say the Devil’s Dead” and other tried-and-true festival crowd-pleasers. Other performers on Saturday included Alfie O’Shea, Yokeshire, Step About Boston, Norman Payne, The Jolly Tinkers, The Gobshites, Erin’s Guild, The Auld Locals, The Tom Lanigan Band, and members of Boston’s Reynolds-Hanafin-Cooley branch of Comhaltas Ceoltóirí Éireann, who hosted a ceili. At the edge of Emerald Field, a contingent of Irish wolfhounds relaxed in the shade, seemingly oblivious to the stares of children, and not a few adults, amazed at the dogs’ enormous stature. Some festival-goers browsed the merchandise of vendors in the Grafton Street tent, or opted for light refreshments in the Tea House tent.